“What has this all to do with your work?” – I was asked recently discussing my blog and the person questioning me noticed the hardly not to notice political overtone of the last blog entries. The answer is very simple: the roller coaster on the political scene influences together with the water scare and now the polony scandal the psyche of the people around us – the madness of state capture, the midnight changes in cabinet, the economic meltdown of South Africa in the last years resulted in more food-insecurity, in more unemployment, in more emptiness, in more loss of perspective as society. Students were encouraged to demand fee-free education which is in itself a non-sense, as there is nothing for free and the result of the reckless announcement of former President Jacob Zuma of the implementation of for said “free” education means now in return an increase in VAT and again, the poor have to carry the biggest burden. The unstable politics of the last years have taken a toll in all spheres of society and the divided ruling party, warming up to the party of the Gucci revolutionary “Commander in Chaos” with his only hardly veiled racism and power hunger balances the hope of a better future with the new president again negatively. Add in the Western Province the serious threat of taps running dry – it all creates a situation where people are visibly on edge and less inclined to think rational and with measure. HOPE Cape Town developed since years already a second arm of service which aims to assist those in need not only in the medical field, but also tries to remedy social woes of troubled South African families: poverty, lack of education, early childhood development and deficits in the framework of broken communities – read drugs, alcoholism, broken families, gangs, violence, corruption – has to be tackled simultaneously with any medical intervention to be successful. This social services and assistance arm will be further developed – a part-time social worker and an occupational therapist are at the core of those developments working hand in hand with the doctors and the social system of the state – latter unfortunately a broken system with gaps hurting and killing children as a result. The pain giving birth to a new and democratic South Africa with all the up’s and down’s are impacting in many practical terms the work of NGO’s like ours. Strikes and service delivery protests are damaging not only infrastructure but people engaged in those activities often forget their medication, their doctor’s appointment or even to put food on the table for the family. Corruption on all levels of society makes life more expensive for those anyhow struggling to make ends meet – and if delivery of state services are chaotic it is indeed difficult to get the papers needed for e.g. registering somebody into school. And people who have nothing to lose anymore are obviously vulnerable to propaganda and ideology which wouldn’t make sense if one would have the time and the education to ponder what is often told from politicians in public. The world is in the moment globally a bit in turmoil, and working in the non-profit part of it means to be vigilant and vocal for all those who have no voice or are somehow silenced by food parcels and t-shirts or a free meal – popular methods of those wanting to remain in power here in South Africa. I guess for those you knew the situation well enough, the downgrading of South Africa to “junk status” came at no surprise. A cabinet reshuffle at midnight, ministers axed not informed directly but learning it from the TV news does not indicate a rational and honest move of a president reflecting on his actions. The knives are out – and once again history shows that a liberation army styled as a political party will fail the people ungraciously if the transformation of the structures which were needed during the struggle does not happen in time. The desperate attempts to quell the public dissent within the ruling party is witness to the unhappiness within and the tweets of government to stop civil society to voice their opinion adds a more comic note to the very serious situation. South Africa can fall into the trap of inner conflict and anarchy if the stalemate between those who want to rectify the situation and those whose greed and / or ideology clouds their judgement is not resolved and decisions are made to get out from this road leading to nowhere. It’s not only the president who has to go – all his cronies and blind followers from Gigaba to Mbalula, from Dlamini to Mtambi have to be relieved from their duties to rescue the situation. I think the most hurtful matter is that a black majority feels the disappointment that their own people failed them greatly. This generates automatically defenses which are not helpful in the situation and one should be reminded that worldwide liberation movements are bad politicians in the first and sometimes second generation. The dream of the rainbow nation seems so far away for the time being, but not everything is lost. There are millions of people who are willing to work hard to change the situation and to make the peaceful transition in 1994 a permanent feature; radical economic transition will follow if radical does not mean corruption and entitlement but good school education, adequate university studies and the equal chance of everybody to develop entrepreneurial skills as well as the chance to climb the career ladder because of skills and not of skin color. As much as one wishes for a quick transformation – if it should be sustainable it must be the result of hard work and not gifts and badly handled BEE. Times like this call for all citizens to organize and assist government to develop a society. NGO’s play a vital part in this scenario and I hope and pray that HOPE Cape Town can play its role in this unruly times. Making sure that health service delivery is maintained on a dignified level may for some be not the first priority, but I believe that only the concert of all playing their particular part in times of uncertainty can bring a society through those times into a more stable period of living in the new South Africa. 10/21/2016 • 7:18 am Comments Off on What must fall – fees or the South African State? What must fall – fees or the South African State? The polarising effects of #FeesMustFall are now pervasive in the academy, and probably beyond. Academics turn on each other, as do their schools and faculties. Whole universities are pitted against one another – the “Wits option” vs the “UCT option”. Some academics are accused of being blindly supportive of “the innocent students” and parading their colours as the immaculate left; while others are seen as blindly securocrat, unreconstructed racists, or terminally bewildered. So let’s (try to) agree on a modicum of common ground. Remarkably, there is a lot of it about. No-one can reasonably argue that universities are not underfunded. No-one can reasonably argue that the impact of underfunding has been transferred to fee increases, and that in turn, black (primarily African and coloured) students bear the burden. Given the failure of the post-apartheid economy to sufficiently redistribute wealth and the abject failure of trickle-down economics, “black debt” is a reality. Let’s also accept that for many students, much of the academy is an alienating, overwhelmingly white, Eurocentric space and experience. Students arrive and are expected to meet imported norms, seminar room sarcasm, unknown customs, foreign authors, hard marking and plain hard slog of tertiary education, while being young and going through their own life transitions, and doing so in “othered” spaces, out of vernacular, and so on. Let us also agree that virtually no university or further education college has genuinely grappled (institutionally, not at the level of the individual) with what it means to decolonise, beyond (at best) looking around quickly for some black/African authors. This is not true at school level, where many advances have been made – but these are islands in an ocean. Students swim in the ocean. Let’s also accept the dangers of commodified knowledge and universities, and the fact that the system is slowly becoming a sausage machine for lawyers, accountants, MBAs and others deemed economically necessary for the economy. Those schools and faculties seen to add no “dollar value” are discriminated against locally and globally. I say “let’s agree” because these issues have all been agreed to by both protesters and university management. There may be quibbles over the severity of this or that issue in this or that part of the sector, but the central issues are undisputed. So what divides us, and with such vehemence? For the immaculate left, it is ultimately a capitalist state that has no interest in the poor emerging from poverty; overlapping with black people in a society dominated by whiteliness; creating an unreconstructed racial capitalism that needs to be toppled. Students in this view lack agency, and are in every context victims of external forces. Every action is the response of victim to oppressor. “Senior management” is seen to lead with security, follow up with more security, and have no interest in negotiation or compromise. 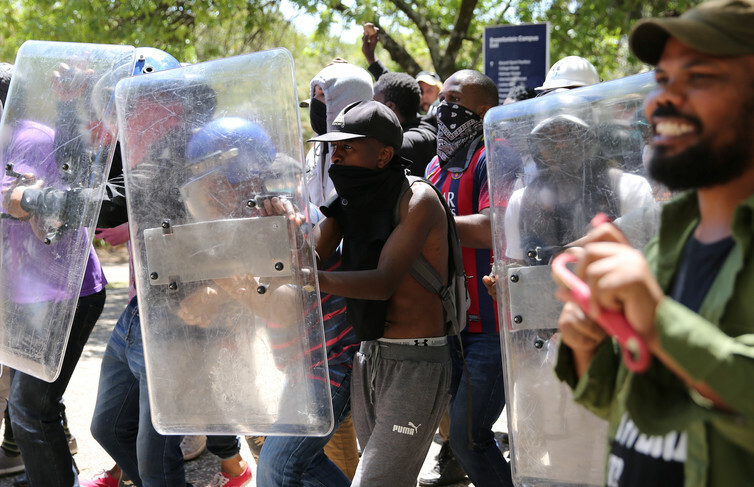 Students just want a free, decolonised education in a transformed institution and are shot for daring to ask for it – and they remain innocent, brutalised “black bodies”. For those who are not in this group, there is a basic commitment to teach, and to getting students to complete the academic year. They are disregarded as “liberals”, the ultimate South African insult. Security is regarded as a necessary evil – but since many academics have personally been assaulted and/or abused and/or disrupted, and many targeted for hiding students desperate to learn and/or shielding them from protesters, security seems a basic necessity. The pleas from students for support to finish the year have been incessant. What is at fault with all these views is the assumption that if protesters win enough compromises – such as sector-wide agreement on free, quality, decolonised education and the need to plan, design and cost it so that it can be an implementable reality not a slogan (being self-evidently not swiftly realised) – they will return to class. And they will do so as victors. We know that the vast majority of non-protesters also want to be back in class – and a great many are there already. But this core assumption is wrong. It is increasingly difficult to retreat from the notion that this is an incipient insurrection. While some protesters are undoubtedly idealistic and brave fighters for free quality education, the movement of 2015 has been colonised by political parties and anarchist movements in 2016. A movement without prominent leaders of 2015 has become leaderless in 2016. Acts of bravery and camaraderie in 2015 have become acts of racist abuse and thuggish violence in 2016. Burning has replaced marching; destruction of university infrastructure is a key goal. This is no longer #FeesMustFall as we knew it – it has become #StateMustFall. Universities are being used for testing the potential for broader insurrection –- if you can bring down universities you can bring down cities, if you can bring down cities, you can collapse and take control of the state. No compromise will get the core protesters back into class, or satisfy their academic or political mentors, because their goal is so much larger: state capture. It has allegedly been done once under democracy, so why not again? Politics hates a vacuum, more than nature. The ruling African National Congress (ANC) is morally compromised on every front. Seemingly all courts in the land are packed with lawyers attempting to stop good governance and allow uninterrupted bingeing at the trough. The brazen moves to cover various political derrieres are breathtaking – but create space for any other party to claim the moral high ground. In 1976 during the Soweto youth uprising, protesting students were given political education by mainly the Black Consciousness Movement. Those students went into exile got their education from the liberation movement organisations, the ANC and the Pan-Africanist Congress (PAC). Whether they were Africanist – closer to the PAC – or Charterist – aligned with the ANC – they were taught about the democratic state that had to be built and the principles on which it was to be built. Who now provides political education for protesting students? The ANC is utterly compromised and cannot claim the moral authority to “lead”. The Democratic Alliance and ANC student wings, DASO and Sasco respectively, were loud in proclaiming their various Student Representative Council victories earlier in the year but have vanished from the scene. The prominence of Economic Freedom Fighters leaders – at national and student level – may or may not be relevant. So too the various incarnations of Black First Land First, pan-Africanist student movements and others. We are reduced to using student leaders of the 1980s as mediators, still on the faulty assumption that protesters want to return to class. They don’t. They are far more ambitious than that. We have to call the bluff of those who keep moving the goalposts. Universities have agreed to free, quality, decolonised education in a transformed institution. Exam dates have been changed. Exam content is being modified to accommodate lost classes. But then the demands shift – we want this fully legislated now, or we won’t return to class. Or, we want amnesty for students suspended after due process regardless of what they did. Or, we want students arrested by police released. And so on and so on. These are patently not demands that the academy has the legal mandate to meet, even if we assume it had the will so to do. There is no place for [the Bantu] in the European community above the level of certain forms of labour … What is the use of teaching the Bantu child mathematics when it cannot use it in practice? That is quite absurd. If, as seems likely, for the second year in a row, university students in South Africa are going to complete only part of their annual curriculum, and will be examined on only part of their curriculum, the result is that every subsequent year is divided between “catching up” on what was missed and squeezing a year of teaching into less time – we face the danger of ensuring that no student will receive even a quality colonised education (an oxymoron for some, of course). We are not educating our students to compete locally or globally. We are crippling them. They are being sacrificed for the few who see state capture as tantalisingly close. Disclosure statement: David Everatt does not work for, consult, own shares in or receive funding from any company or organisation that would benefit from this article, and has disclosed no relevant affiliations beyond the academic appointment above. South Africa is in turmoil – not only statistics proof that crime is up and corruption a daily almost accepted occurrence. It seems that the country is going backwards, the dream of a rainbow nation is fading away and an ANC being a shadow of its former glory seems determined to let No 1, as President Zuma is often called ruin the country to junk status. The rot goes deep and the in-fights between treasury and president, the state capture through all the Gupta’s and other presidential friends, the formation of a new council giving Zuma more weight determining the future of SOE’s in South Africa – this all influences obviously also the work of NGO’s and other entities in the country. Focus is on the political and social high drama, money is spend on campaigns and court proceedings to get to the truthful facts and it seems that our society in need of healing is completely neglected in this battle of the powers in charge of running the country, the provinces, districts and the municipalities. Who has thought that the local municipal elections help to clear the field – it seems the opposite: the fight for power and money has intensified and more questions are added every day instead of being satisfactory answered and then moved forward. The old saying that freedom fighters are bad politicians is proven correct again and history repeats itself in so many ways. South Africa, as a BRICS state is also not anymore considered by many other countries as a purely “developing country” which makes the trouble for an NGO even worse as fundraising becomes more difficult on an international platform. There are many who seems to believe South Africa is doomed like so many other countries, others believe that this country will turn the tide soon and will rise like the phoenix out of the ashes. Whatever it may be – people at the bottom of society are continue to suffer now, the lack of proper education makes it easy for those in power to influence and manipulate the masses. The service deliver protests and the instability within police and state security, seemingly a playground for those in power allow for justice delayed in many cases for years. This all makes it so much more important that the initiatives of churches, NGO’s and other non – governmental institutes are able to do their work and to assist in the daily life of those not able to defend themselves or having a future without help from outside their homes and families. Health and education are two pillars to be strengthened if South Africa wants to overcome this period of chaos. HOPE Cape Town is only one of many NGO’s trying to aid in those fields and will remain steadfast in its approach to add to the healing of a wounded country – small contributions but many drops will fill finally the ocean – so another saying. It is the time of the year – May and the prestigious Ball of HOPE is on again – this year with Nevio Passaro as a special guest coming from Germany to entertain those lucky to have a ticket. A sold out event is always a dream for the organizers and also this year we are indeed full to capacity. The Southern African – German Chamber of Commerce and HOPE Cape Town celebrating 15 years of the Ball of HOPE, 15 years of HOPE Cape Town Association and 10 years of HOPE Cape Town Trust. Time is indeed flying and it seems yesterday when we started humbly with opening the ward G7 at Tygerberg Children’s Hospital. Was it at the beginning important to have a ward dedicated to infectious diseases and to administer treatment – in those days government were battling anti-retrovirals as poison – so is the scenario now completely different. The mother to child transmission rate is down to 5% but could be pressed further down to under 1%. People on anti-retroviral treatment are staying healthy longer and longer – but still HIV is a major contributor to the death toll of South Africa. All the prevention work has not cut down the new infection rate the way it was expected – so the status quo of HIV in South Africa is still remaining a mixed one. 15 years of HOPE Cape Town Association also means 15 years of support from so many different people, some being members of the HOPE family since interception of the project, others have come and gone and many are joining in our days. They are all a blessing for those HOPE Cape Town is able to assist in getting a life back with the possibility of a good future. But “balls” are not falling from heaven – preparation is hard work and bringing together great entertainment, good food and all the logistics coming with it seems every year to be a never-ending story. That the AGM of the HOPE Cape Town Trust is the very same day of the Ball of HOPE makes this day even more challenging. If you live in South Africa welcome to watch Expresso Show on SABC 2 Friday, 6th of May in the morning and watch Katlego Maboe, our HOPE Cape Town Goodwill Ambassador performing with Nevio Passaro from Germany. So you get a glimpse of what to expect at the Ball of HOPE 2016. But May is not only marked by this local event, HOPE Cape Town is adding a new sister entity called “HOPE Cape Town USA” which was founded in Dallas Texas some weeks ago. I will fly to the first directors meeting mid May and if you read this blog and live in or around Dallas, New York, Los Angeles, Chicago or New Jersey and you want to help, assist, meet up – just let me know and we will get in touch. The HOPE family is growing and being a HOPE ambassador is a worthwhile cause. Spread the word, make connections, support those living here in South Africa with little hope for a bride future. HIV, TB and related illnesses, connected with poverty, unemployment, weak education is a recipe for disaster, not only in a personal life but at the end for a society as a whole. You can make a difference in the life of others – count your blessings and pass on some to those without/.